As a small business owner, you have a lot on your plate. First of all, you handle the bulk of the work. You’re the one who knows how to create your product, and you’re the one that needs to take care of everyone else. Second of all, you’re learning as you go. There’s a certainly a learning curve that comes with owning your own business, from figuring out payroll, to creating good supplier and customer relationships. You probably have early mornings, and very late nights. So, if there was something you could take off of your plate, that would save you money, and make your business better, wouldn’t you do it? Companies that do everything in-house have to spend considerably more time researching, developing, and marketing. This extra time and expense then has to be passed on to customers, which means your prices get higher. By outsourcing, you cut costs, which means you can cut prices, immediately giving you a more competitive edge. When you outsource your IT, the company your hire has one job: to handle your IT. While they do have other clients, fixing IT problems is their singular focus. That means that when something goes wrong, they can devote their time to fixing it immediately. That also means that when you’re looking for some improvements, or you have an IT project you want taken care of, they can put considerably more energy and time into it, ensuring the project or problem is fixed quickly. Everyone has a finite amount of time. If you’re spending your time trying to learn how to improve your small business’ IT, you’re not spending time on increasing revenue, or ensuring that the rest of your company is running smoothly. By outsourcing the things that you know less about, and don’t actually have time for, you’ll be able to put more time into growing the core of your business, which benefits both you, and your company. If you’re trying to compete with “big” companies, you’re going to need to outsource. Unfortunately, there’s no way you can access or afford the same amount of tech and software without either a lot of money, or outside support. As a small business, if you only have one IT person, and are using only what you’ve got, you won’t be able to afford advanced IT solutions that will increase your efficiency. By outsourcing, you’ll have a full team of experienced IT professionals behind you, which means you can have advanced IT solutions at a cost that is affordable to your small business. Finally, the most obvious benefit of outsourced IT services: the savings. In-house IT is expensive, there’s no getting around it. From security software to servers to IT staff, IT is costly all the way around. Outsourcing IT cuts costs in two ways: first on your payroll, and second on your overall capital costs. When you’re a small business, all you really need is your computers up and running, and a quick fix when they go down. There’s not a lot of everyday error or issue that happens when you only have a few employees. That means it’s really not worth it to hire, train and pay your own IT person a full-time salary. By outsourcing your IT services, you eliminate the extra labor cost that is largely extraneous anyway, allowing you to put those resources into another area that could really use the extra money. In terms of capital cost, outsourcing can save you a ton. Initially, you don’t have to worry about funding large expenditures, like servers and additional software, when you’re just starting out. And instead of having to pay for support around the clock, with an IT services company, you’ll only be paying for help when you actually need it. For small businesses, that alone can cut costs exponentially, freeing up capital that you can now put into revenue-producing activities. As you expand, you can always invest in some of those larger expenditures, but as you’re starting out, you can focus the money on what’s most important – growing the company itself. If your small business is looking to outsource your IT services, Red Five IT can help. With years experience in the industry, all of our employees are trained and certified to handle any system you’ve got going. And with flexible managed IT service plans, you can find the perfect IT solution for your company, that fits your budget. 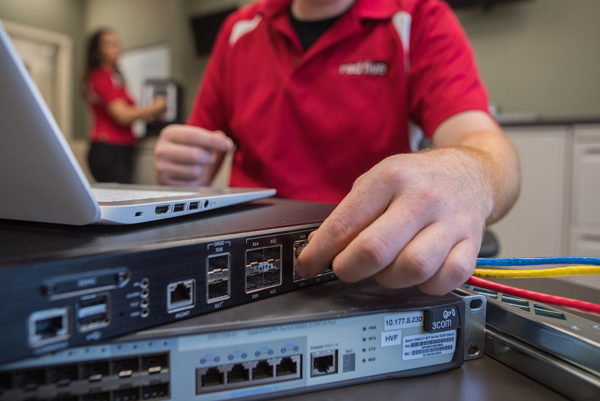 Make your life easier, and your network better; give Red Five IT a call at 1-877-890-7335, or contact us online today!